One prime example comes from Portland indie artist and musician Julianna Bright, who created an alter ego of sorts by the name of Cat Doorman as part of her foray into the kids music scene. Her first album, the Cat Doorman Songbook, is one of the most wonderful collections of unexpectedly lyrical, catchy, clever, whimsical, touching, and inspiring folksy songs that our vehicle’s CD player has had the pleasure of playing. Because my boys just can’t get enough. Kids: To get it done! Cat: And you’re not too precious… to wash the dishes. Another favorite of mine is the alphabetic song “So Many Words,” which is not only super catchy but also astoundingly high-thinking in its word choices for each letter of the alphabet. There’s no “A is for Apple” here. Rather, A is for Agate, Allosaurus, Aeronautic, Atom, Abacus, and Archipelago. And that’s just A! I love songs that don’t talk down to kids, but inspire them (and their parents) to learn more. This collection of songs doesn’t just inspire to learn, but it inspires to create, to imagine, to dance, to clap, and to bask in creation. The radio tuned down low. Or to be studied in a cage. And we may just be the ones to turn the page. We enjoyed this album so much, that when I found out Cat Doorman and her band were going to be appearing in concert at TaborSpace in Portland on Mother’s Day, we made plans to attend as a family. It was just delightful, watching the boys dance around to this music they’ve come to love so quickly. And Julianna herself was so sweet with them — even adding an extra number to the set after Tucker walked up and asked her to hold off on singing “Yeah!” until he returned from a quick-but-much-needed trip to the potty. Great show. The Cat Doorman Songbook is available on Amazon and iTunes, and I’d highly recommend it. You can find her on Facebook as well, if you’d like to know more. Well you’re in luck! I’ve got one to give away! Enter by liking/following (or already being a fan) of Daddy Doctrines or Cat Doorman, on Facebook or Twitter, or by leaving a comment below answering “What was the first concert you remember attending as a child?” Or do them all, and enter yourself five times! More Cat Doorman… and friends! 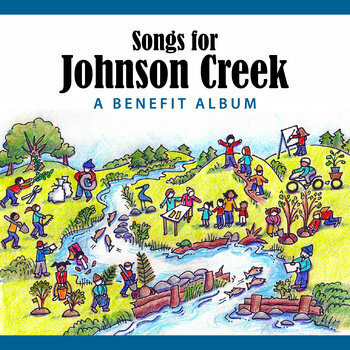 This month also sees the release of Songs for Johnson Creek, a 12-song compilation album bringing together Cat Doorman with other A-list Portland kindie songwriters and performers – from nationally-known artists like Aaron Nigel Smith and Laura Veirs to local favorites like The Alphabeticians and Mo Phillips – to benefit salmon restoration in Portland’s Johnson Creek. The album will be available digitally from Bandcamp on May 23, 2013, and all proceeds from sales will support fish habitat improvements. Note: Promotion open to U.S. residents ages 18+ only, void where prohibited. Winner will be chosen at random on May 23, 2013, and will be notified via email to obtain their U.S. shipping address. If there is no response within 24 hours, or we are unable to verify your entry, an alternate winner will be chosen. Shipping address must be a street address – no P.O. Boxes, must reside in the U.S. Prize provided and delivered by Sugar Mountain PR. Not responsible for lost or misdirected mail. Disclosure: Daddy Doctrines was provided with a CD of the Cat Doorman Songbook for review. All opinions are my own, and those of my kids. Sounds like an awesome album for my grandchildren! I think my first concert, besides family events, was MC Hammer. I hope my answer doesn’t disqualify me! Never went to one as a kid… I think I was 20 and it was JingleBall! I remember Duran Duran and Jamie Cullum were two of the performers. This is cheating a bit… but I grew up listening to “Peter Paul and Mommy” which was recorded live and you can hear the audience on the recording, singing along and applauding, so it *felt* like a concert. First official concert was Air Supply as a teenager. But I do remember going to many less formal folk music and church music events.